Adventuress aims to inspire a conversation and serve as a reminder of the many hands which touch our clothes before we do. 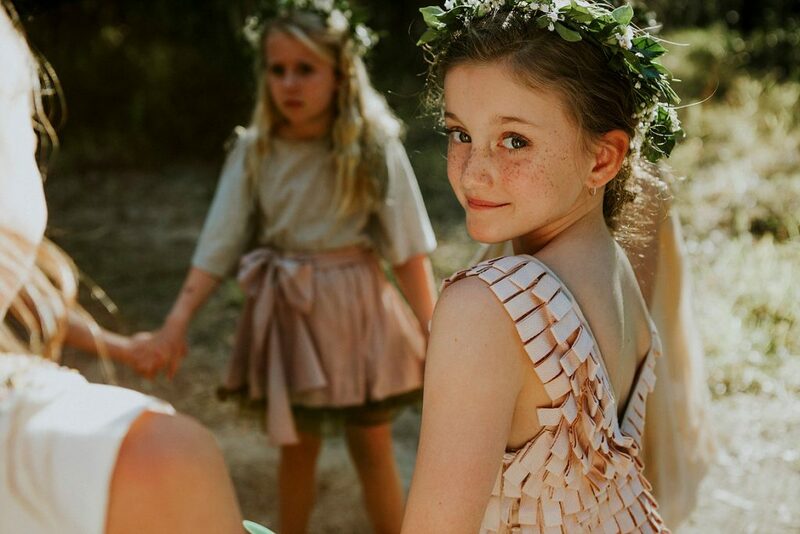 A whimsical, naive and romantic range, Adventuress is my graduate childrenswear collection with a message. Each piece in the collection explores an issue which touches my heart that I hope to share with others. The stories range from the human handpicking of cotton plants, to the thousands of lives lost in the collapse of fashion factories. Adventuress was born out of a desire to create something I believe in. I was confronted with a silenced story of this glamorous industry when I took a class on fashion sustainability, and the way I understood the fashion industry changed drastically. Labour exploitation, incredibly excessive water usage, and an unconscious consumer were just the start of the problem. …consumers must be empowered to help those most in need through a more meaningful connection. I felt compelled to know more, and after some digging, I realised there was no easy solution and few companies were actively seeking one. Then, in 2014, The True Cost documentary was released, exploring the impact of fashion on people and the planet. I was even more motivated. Whilst I felt like I belonged in the fashion course and wanted to make a change, I knew I didn’t want to spend the next eight months on my graduate collection creating something I didn’t believe in. So, Adventuress was born. Now, after finishing, I hope to work in ethical supply chain management. I believe fashion can be a tool for positive change, and consumers must be empowered to help those most in need through a more meaningful connection. Change is inevitable, and I believe traceability and transparency is of critical importance. But above all, I hope your next purchase is a conscious one. Photo credit 1: Piper dress has 1,129 loops of ribbon. They represent the lives that were lost in the Rana Plaza factory collapse in Bangladesh, a factory producing fast fashion for Western consumers. Photo by Amy Higg Photography. Ashley Donald will exhibit her Adventuress children’s fashion collection at the APDL Design Lounge, Level 2 of State Library of Queensland from Tuesday 20 December 2016 until Tuesday 17 January 2017.